Why Should I Own a Food Mill? It’s strange to love something when you don’t know what to call it. I have a tool I use maybe twelve times a year, and those twelve times it’s invaluable. But I’m not sure of its name. It’s a three-piece doohickey with a conical sieve, a wooden pestle, and a three-legged stand. And yes, it is far more than the sum of its parts. 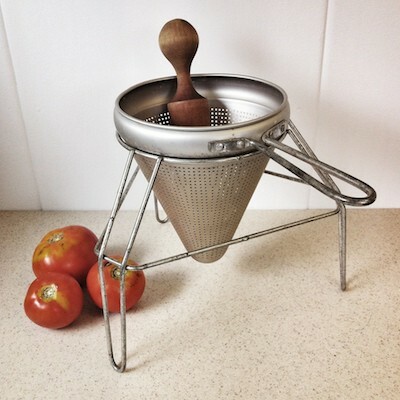 It’s not a food mill , although women who spent thousands of collective hours canning call it that. One of those women is my mother, and she’s the one who gave the rig to me. She’s totally okay not canning anything these days, and I don’t blame her. It’s miserable, messy work. Perhaps my life is too cushy, and I can because I want to be reminded how much labor goes into growing and preserving food. I was a lazy kid, and while mom processed bushels of garden tomatoes into sauce, I dreamily flipped through Judy Blume paperbacks or slouched glassy-eyed in front of episodes of The Flintstones. Now, as I wrangle with steaming vats of water and streaks of tomato juice all over my cabinets, my own young daughter knows to keep a safe distance from the humid inferno of our kitchen, lest her tender ears encounter strings of violent language and the flinging of sodden dishtowels. She takes solace in her colorful plastic ponies, with their ridiculous rainbow manes and tattooed buttocks. She remains ignorant of my sacrifice to provide our family with a dozen jars of BPA-free crushed tomatoes. Nevertheless, I love my food mill rig . It yields the silkiest applesauce, the smoothest pawpaw puree. 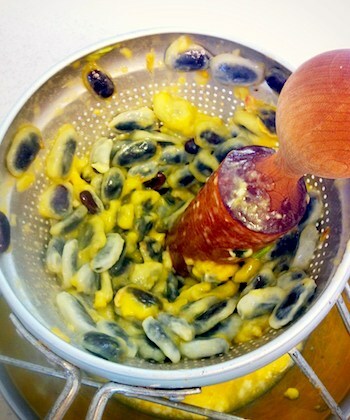 You dump whatever you need to mush up into the perforated sieve, mash it around with the pestle, and collect the puree in a bowl underneath the stand. Various expensive appliances can do versions of this same task—a Cuisinart food processor, a Vitamix, the food grinding attachment for a KitchenAid stand mixer—but they are loud and lumbering, and they don’t strain and puree in one handy step. My rig is just as efficient, and the clockwise motion of the wooden pestle rolling in its groove is both cathartic and hypnotic. Some may call the rig a chinois or, in the non-P.C. terminology of a professional kitchen, a “China cap.” Perhaps this is in reference to those broad, wide pointy hats worn by peasants in fields throughout Asia, though I think it more accurately resembles an ice cream cone. In any case, now you’ll know what to grab when a chef bellows “get me a china cap!” In most high-end kitchens, either one of these fine-mesh tools is indispensable for straining stocks and sauces. It usually has a handle on one end and a bracket on the other, so you can rest the chinois on the lip of a pot. By my conical sieve has no such lip. That’s what the tripod stand is for. It’s worthless without the stand, unless you have a third arm, and if I had a third arm, during canning sessions I’d rather use it for holding a glass of sherry. My love affair with my conical rig is shared by the growing community of preppers—Americans who are stockpiling food and skills to sustain their families when the government/society/energy grid collapses. Outside of an affinity for canning and dehydrated foods, we share little in common. Mennonites and Amish are also fans of the food mill rig. I like to think this tool is at the crux of all these disparate communities: preppers who read articles like “Top 10 Firearms You Need to Get Your Hands on NOW,” women in calico dresses who are probably using actual rags for their menses, and entitled liberal food snobs like me. We must celebrate common ground where we can find it. Maybe I should find some concord grapes and make jam. My rig will rise to the task, and the grapes’ purple hue is just the color of Princess Twilight Sparkle’s mane. Twilight happens to be my daughter’s favorite toy pony. Perhaps I could coax said daughter into the kitchen during this fantasy preserving session, where she can swirl and mash the pestle-pounder in the sieve and participate in mother-daughter bonding as we craft our pony mane jam. I’d like to think one day she will covet ownership of the rig for purposes other than extruding Play-Doh squiggles. If the preppers are right, my family will be going down in the epic battle for survival—too much sherry, not enough actual prepping—and the notion of clunky gee-gaws like my conical sieve rig will be a ludicrous artifact of our idle grasshopper days; instead, we’ll be choking down moss in the woods, praying it’s not poisonous. But I cling to hope, and to the integrity of old things holding value for new generations. If you like to can, get yourself a rig. A bonus: line the sieve part with cheesecloth and it makes a bitchin’ setup for draining yogurt. If not, there’s always Play-Doh noodles.